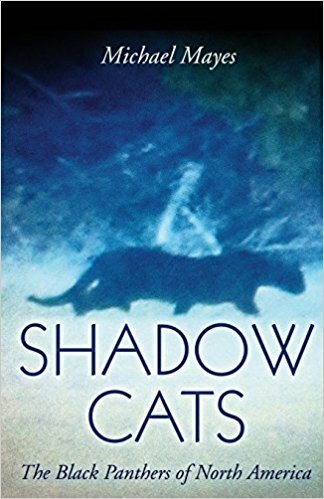 All of you who have read this blog for any length of time at all know that the subject of large, black, long-tailed cats, or “black panthers,” is something in which I am particularly interested. This subject has become the number one most popular topic on this site. 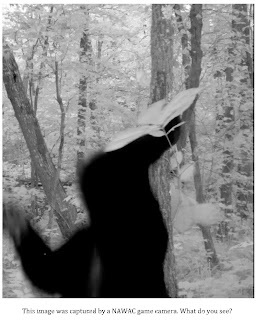 More people contact me about black cat sightings, by far, than sightings or anecdotes about any other animal (known or cryptid). 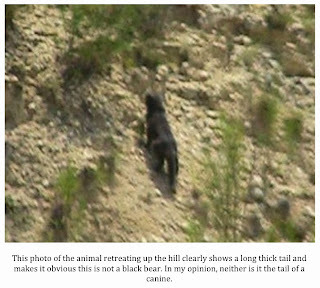 I have always felt that there must be a biological entity behind these “black panther” sightings. There are just too many incidents and too many credible witnesses to believe otherwise, in my opinion. If I am right and there is a real animal out there responsible for these sightings, what could it be? 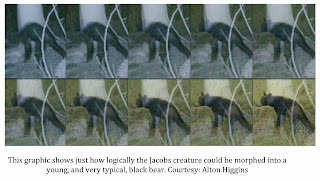 I’ve put forth several possibilities over the years: jaguarundi, jaguar, unusually dark-colored cougars, for example. Perhaps a combination of these three animals plus the occasional case of mistaken identity could explain the phenomenon? 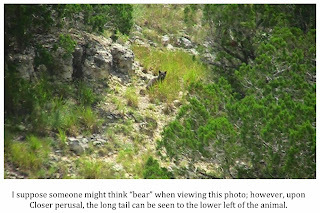 I’ve also entertained the idea, briefly, that maybe cougars in the wild do occasionally exhibit melanism as well as the possibility of an entirely undocumented large, dark-colored cat might exist in Texas and the deep South; however, the culprit most often suspected of being responsible for “black panther” sightings by those who think there is something to all of this is, without a doubt, the jaguar. 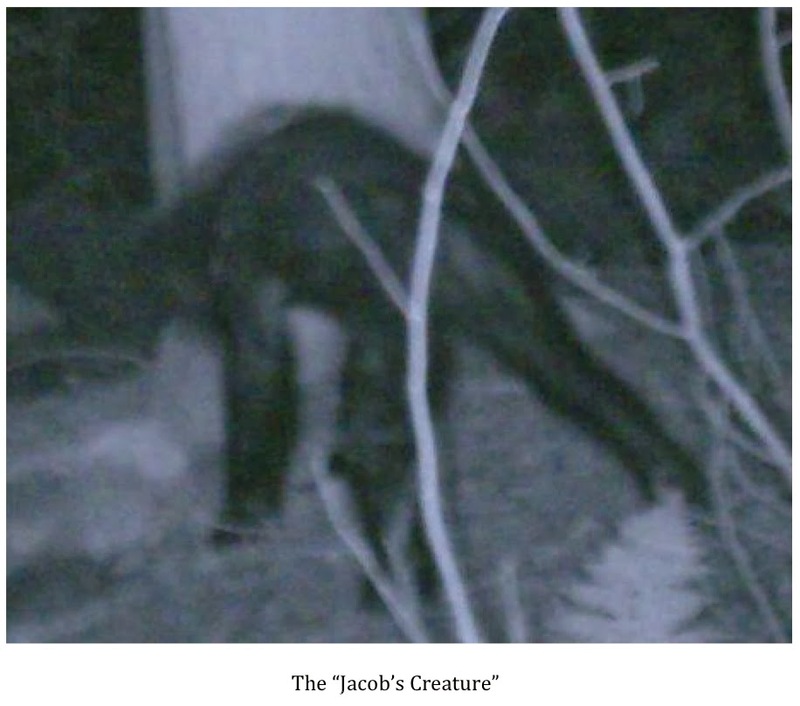 In the past, I’ve been very hesitant to jump on the jaguar (Panthera onca) bandwagon and anoint this big cat as the number one suspect in the hundreds of black cat sightings. Jags fit the bill as far as the size most often reported by “black panther” witnesses. People often describe “Labrador-sized,” or larger, cats with long tails. The jaguar is the largest cat in the New World and ranges in weight from 125-250 lbs. 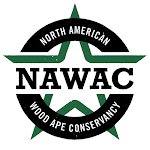 under normal conditions with some males reaching weights in excess of 300 lbs. (very rare). 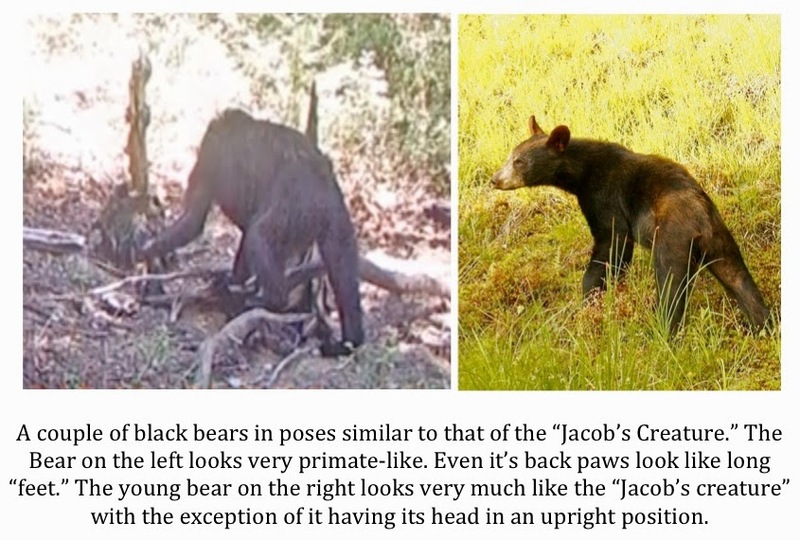 Color morphism does occur in the species with melanistic specimens appearing almost totally black in color. While much more rare than their normal rosette-coated brethren, melanistic jaguars make up approximately 6% of the total jaguar population. That being the case, why have I been hesitant to grasp the theory that “black panthers” may very well be remnant, or Northward wandering, jaguars? The answer is simple. While 6% of the jaguar population is not an insignificant number of individuals, it still leaves 94% of the population with the normal spotted coats. IF the black panthers of Texas are melanistic jaguars then why is nobody seeing or reporting the much more commonly colored cats? 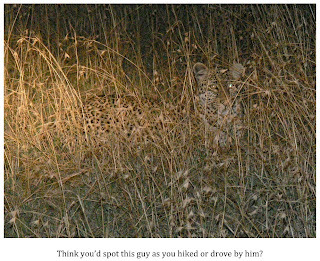 If these are jags people are seeing, the spotted individuals have to be here too. If that is the case, then they would be easier to spot than those of the melanistic variety. Right? 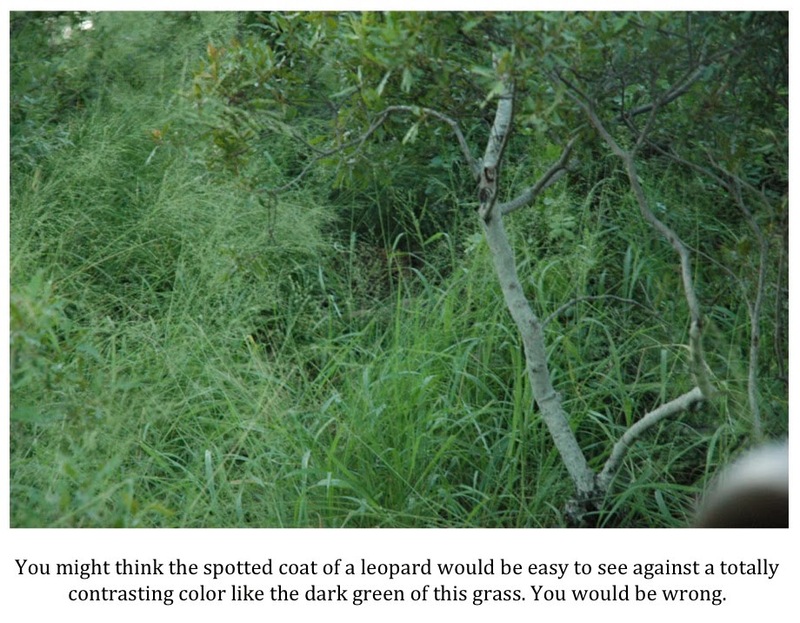 Spotted coats are a tremendous form of camouflage. It is the very reason so many wild cats are marked in this way. They are predators and need to be hard to see. Leopards, jaguars, bobcats, ocelots, margays, servals, cheetahs, young lions and young cougars all have spotted coats for part of, if not all, their lives. 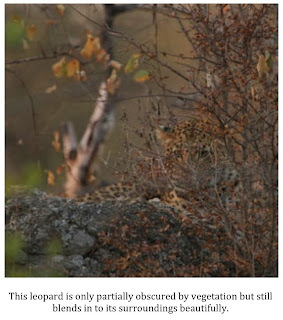 The spots allow these animals to blend into almost any form of cover as they break up the silhouette of the cat beautifully. 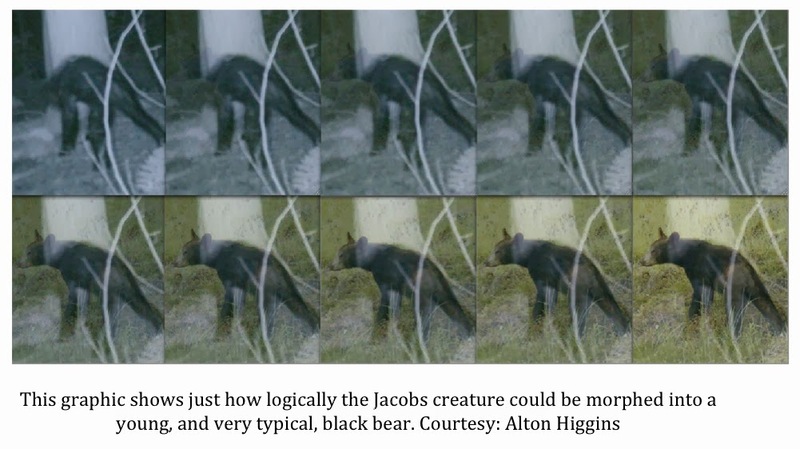 I have come to the conclusion that maybe the large black cats being reported in the South are melanistic jaguars and they are being seen, while their spotted brethren are not, because their black coloration is not as effective a form of camouflage. Allow me to demonstrate. 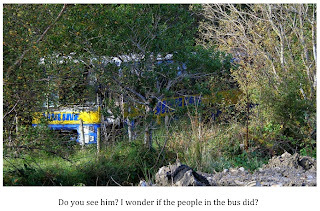 Spread through out this post, is a series of photographs. 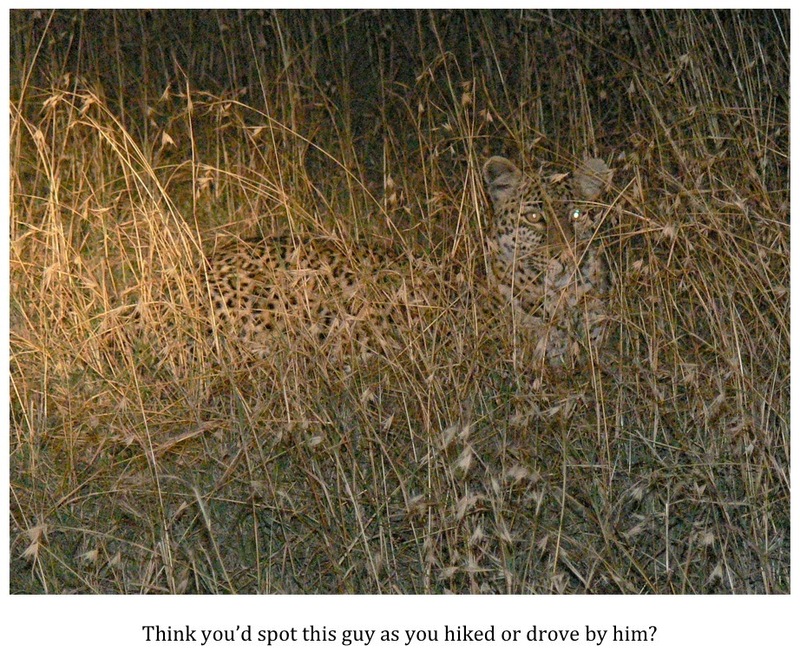 In each photo there is a normally marked leopard or jaguar. These photos have all been circulating for some time now as a sort of “Where’s Waldo” game of find the cat. I’d seen them but not given them a lot of thought. Lately though, I’ve revisited them while considering them as something to study instead of just a hide-and-seek type of game. 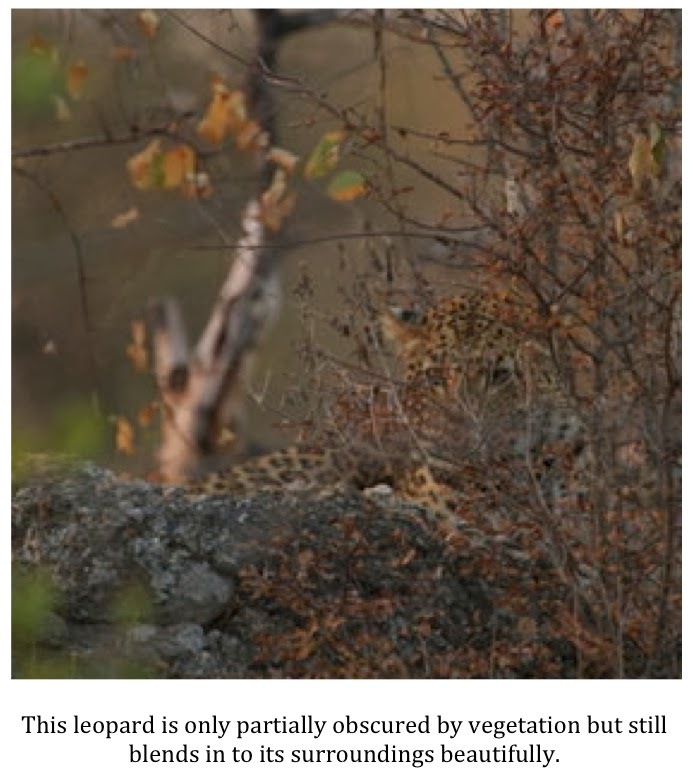 As you will see, or maybe not, the spotted coats of these cats make them all but impossible to detect while a solid black cat might stand out more. 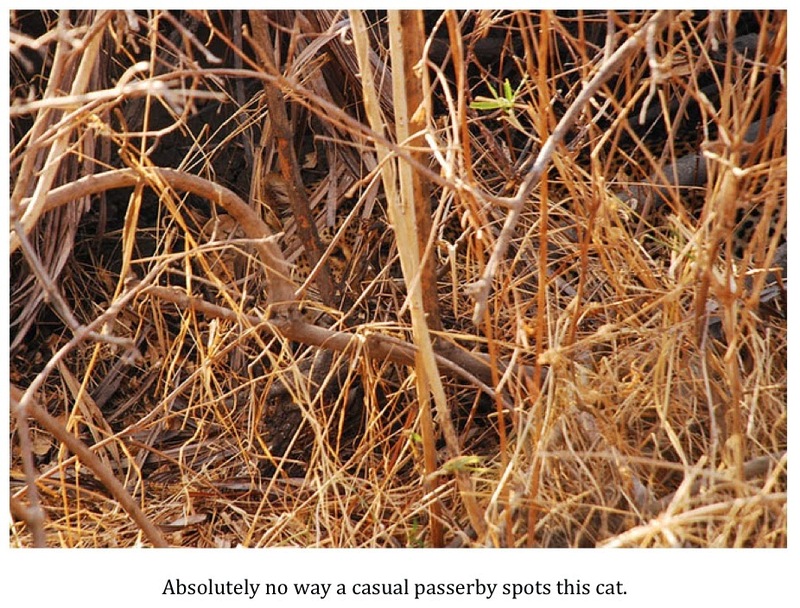 Imagine trying to spot one of these cats that is hunkered down in tall grass or a wooded area from a moving car or even as you walk through the woods. If it remains still, you aren’t going to see it. As a matter of fact, just standing or sitting perfectly still in and of itself can keep an animal well hidden. 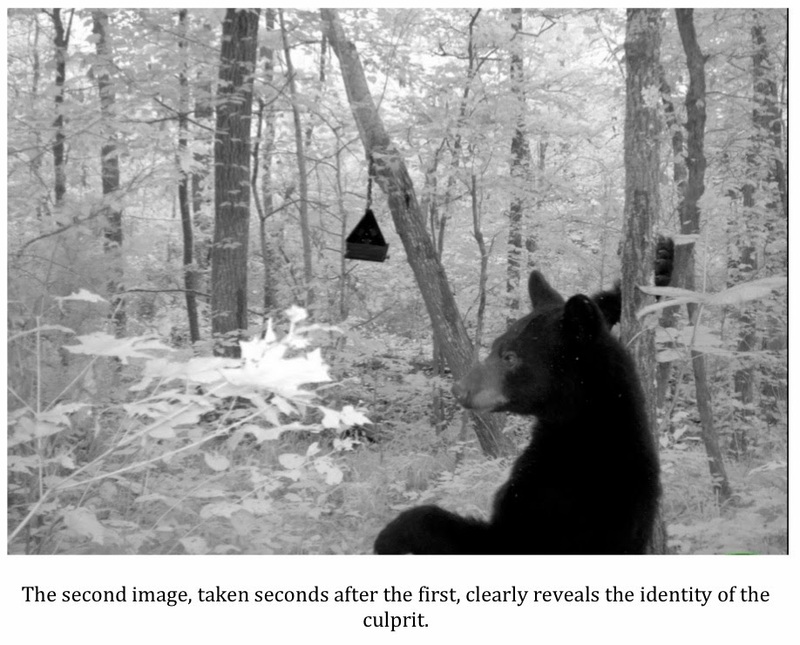 We, as humans, seem to depend on movement to a large extent in order to spot things. 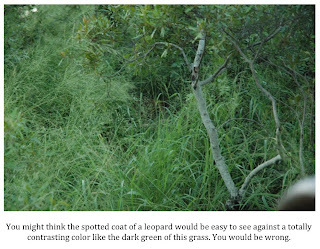 Add the fact that we, as a species, have become less and less in tune to nature and become unobservant, at best, and totally oblivious, at worst, and not many of these animals are going to be seen, not even those that are not thought of as having perfect camouflage. The photo below illustrates this point. 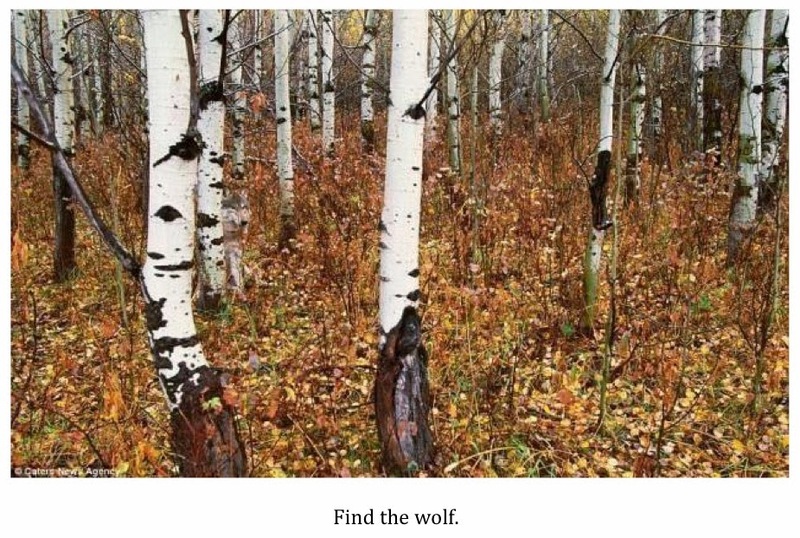 See how long it takes you to see the wolf in the photo. 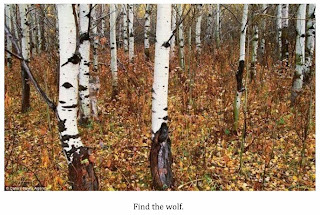 Some will see the wolf quicker than others but there is no denying that he would be very easy to miss despite not sporting a spotted coat. IF the “black panthers” of Texas are jaguars, then the much more common spotted cats are here, too. They are just going to be almost impossible to detect unless they cross a road directly in front of a vehicle. Jaguars were native to Texas and much of the deep South at one time. Maybe they are making a bit of a comeback, much as cougars appear to be doing, across much of their old range. What a great story it would be if it turned out to be so. "A tiger does not lose sleep over the opinions of sheep." Nestled in the foothills of the ancient Texas Hill Country, San Antonio sits and looks every bit the part of a modern American city. Glass skyscrapers and the Tower of the Americas kiss the azure Texas sky, while below the hustle and bustle of city life continues unabated. In San Antonio, however, the old is never too far from the new and history is everywhere. Night is the time when the weight of it seems the most oppressive. You can just feel that important things happened here and on nights when the moon is small, or absent all together, you can almost imagine seeing the ghosts yourself. Don’t let the somewhat silly-sounding name fool you. The “Donkey Lady” has been a source of terror for residents of south San Antonio for generations. As with most legends, there are various versions of the story; all attempting to explain the origin of the “Donkey Lady.” Though they all vary slightly, the tales have enough in common to make it seem plausible that there is a seed of truth in them. 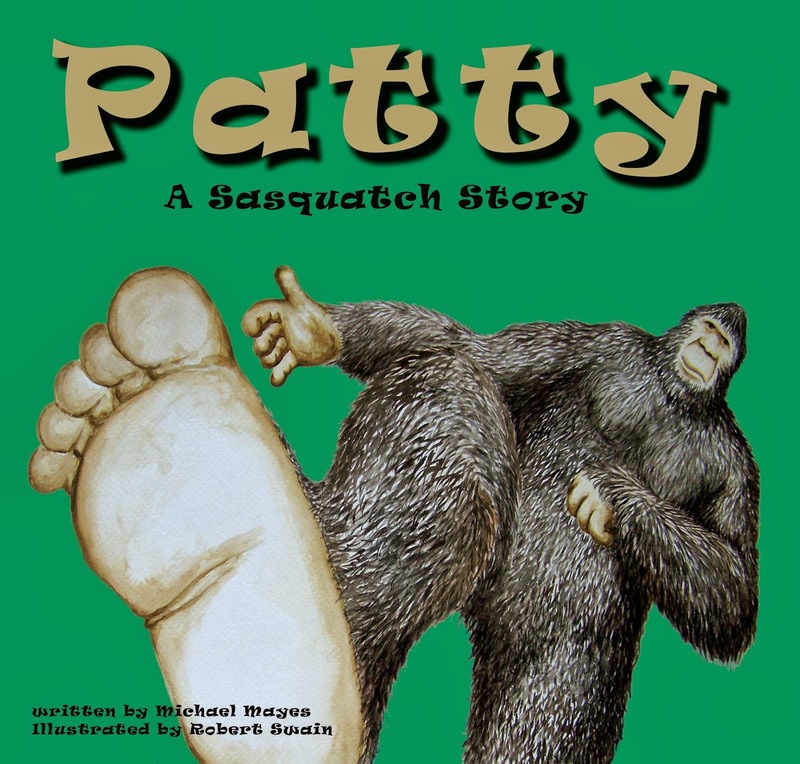 I will recount the version of the legend I heard years ago as a young boy. Years ago, most agree sometime in the mid 1800’s, a settler woman lived near the banks of Elm Creek with her husband and two children. The couple was barely scratching out a living from farming the stingy South Texas soil and raising a few head of livestock. One day, the son of a wealthy San Antonio merchant came riding onto or near their property. Somehow, the young man came into contact with a horse or mule belonging to the pioneer family. The young man, the story goes, teased the animal and hit it with a stick. The poor animal retaliated in the only way it knew how and bit the merchant’s son. Enraged, the young man began to beat the animal even more severely than before. The poor creature’s cries reached the ears of the pioneer couple and they quickly rushed to the scene. It became obvious to the couple that their animal, no doubt vital to their livelihood, was about to be beaten to death. The couple began throwing rocks at their animal’s assailant and pelted him several times. They did not realize this young man was the son of an important man in town. The young man hurled a string of expletives at the couple as he retreated but swore he would get even with them. That night, a party of men, led by the wealthy merchant and his son, stealthily approached the young family’s cabin and set fire to it with torches. The heavily armed men refused to allow anyone inside the cabin to leave. Desperate, the man of the house attempted to make a break for it in the hopes that his wife and children could escape while he distracted their attackers. Alas, he was gunned down almost immediately upon setting foot outside the cabin. The screams of the woman and her children as they burned alive were heard up and down the creek for over a mile. Just as the mob was sure that their unholy task was complete, a figure, engulfed in flames, smashed through what was left of one of the cabin windows and staggered toward the stunned and now terrified men. The woman’s hands seemed to have been burned down to mere nubs and her face appeared to have melted or sagged to the point that it was unnaturally long and deformed. The poor creature’s clothes were gone, burned away, revealing skin charred completely black yet, somehow, still on fire. The wretched creature that had once been a happy, sod-busting wife and mother let out a bone-chilling wail and then staggered past the men and hurled herself off the bank and into the waters of Elm Creek. The criminal mob followed to the point from which she had launched herself into the black water but saw no trace of her. Her body, it is said, was never found. 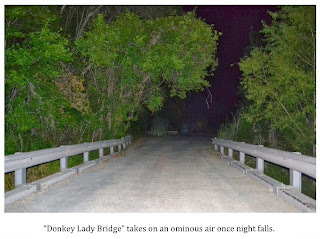 Since that terrible night, travelers who tarry too long on or near the bridge have occasionally reported terrifying run-ins with the “Donkey Lady.” Horrible screeching and screaming is reported from time to time emanating from under the bridge or the surrounding woods. Some have claimed a malevolent creature of some kind has dropped onto the hood or roof of their vehicle, screamed loudly and scratched and clawed at the windows in an attempt to get at them. 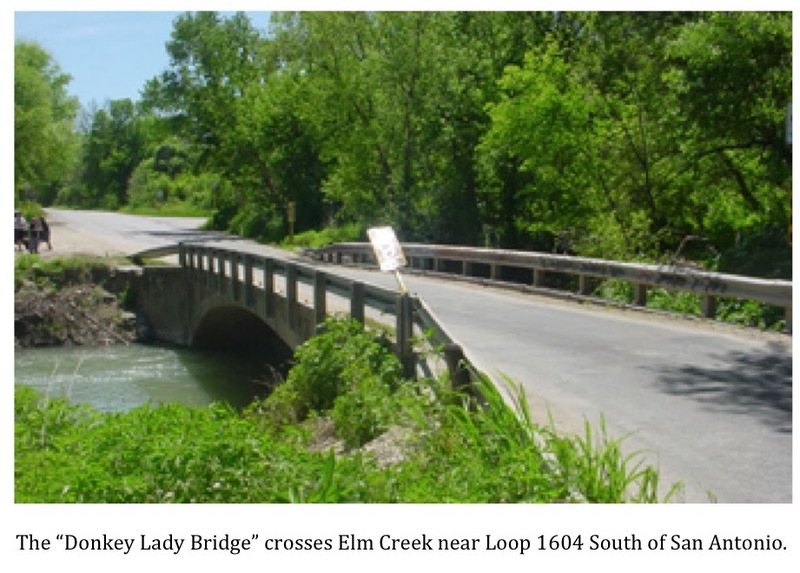 Photos exist of damage allegedly done to vehicles by the “Donkey Lady.” It is said that if you park on the bridge, shut off your headlights and wait, you will almost certainly encounter something truly terrifying. I have absolutely no idea how much, if any, of the above tale is true. I’ve become familiar with other versions in the years since I heard this account. Whether they contain more or less truth than the version I grew up with is something I just can’t say. I do tend to believe that there is some germ of truth in the “Donkey Lady” legends. The tale has endured far too long for that not to be the case, in my opinion. What interests me more than whether or not the stories are true is what people are still seeing on or near the Elm Creek Bridge. Could there be a flesh and blood creature responsible for the legends? If so, what could it be? Many have screwed up their courage and ventured under the bridge to examine the muddy bank for clues. Some have come back with photos of hoof-like tracks. Is this proof that the “Donkey Lady” exists? I would hesitate to say that. This is Texas, after all, and finding the tracks of a horse or mule anywhere in this state, even under the “Donkey Lady Bridge,” would not be all that unusual; however, whatever haunts this bridge and the surrounding woods is still seen on occasion and is heard more often than that to this very day. If anyone out there reading this post has had any experiences at the “Donkey Lady Bridge,” I’d love to hear about them. I’ll, no doubt, receive criticism from some for this post. To some degree this is understandable, as the tale of the “Donkey Lady” of Elm Creek seems more of a ghost story than anything else. 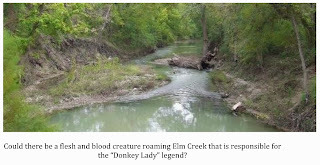 Still, ghosts typically don’t dent hoods or leave hoof-like tracks in the mud of creek banks. Maybe there is a biological explanation for the legends. If so, then the story of the San Antonio “Donkey Lady” definitely belongs here. In addition, I’ve inadvertently become something of an amateur folklorist while doing research on historical sightings of wild men, black panthers and river monsters. I’ve run across all kinds of interesting stuff and I have a hard time not sharing a great story. … it’s a heck of a good story. 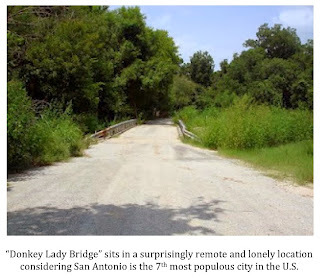 * To visit the “Donkey Lady Bridge” in San Antonio, Texas, start at the intersection of Jett Road and Loop 1604 south of San Antonio. Go 1.9 miles north on Jett Road. The bridge is on the left (north) side of the road. It used to be the intersection of the Old Applewhite and Jett Roads. It is now the Old Applewhite Bridge Trailhead. 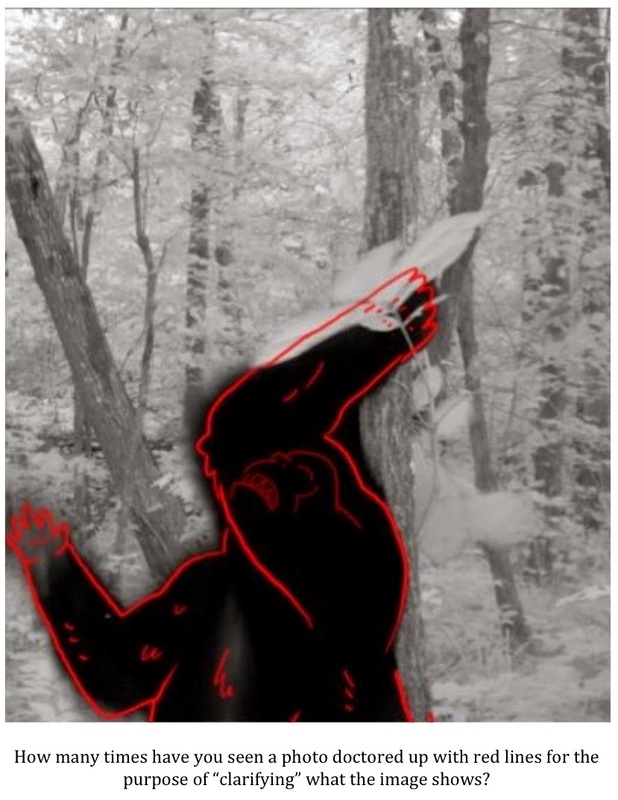 Black Panthers: Photographic Evidence At Last? This post will be much heavier on photos than writing. That is good news as a picture truly is worth a thousand words. That being said, let’s go. Two different readers have sent me photos of large cats over the last couple of weeks. Both sets of photos come from South Texas and both are interesting in their own way. I’ll take them one at a time. The first two photos come from Uvalde County. 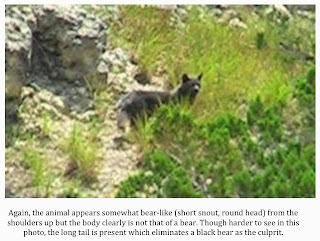 The photos clearly show what appears to be a large, long-tailed cat of some kind. 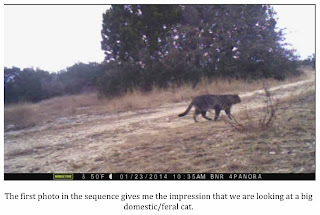 It is unusual in that the markings of the cat appear to be a cross between what you would expect to see on a bobcat and what you see on a common domestic/feral cat. 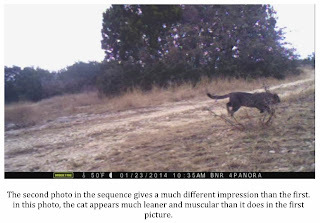 The photo where the cat is in motion is the most interesting as it makes the cat look lean and extremely muscular. 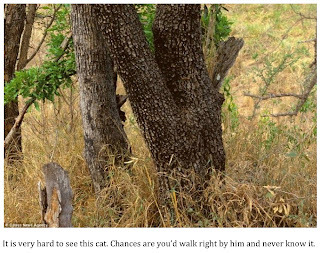 The photo where the cat is walking slowly gives a slightly different impression. It appears very, very thick, almost beefy. 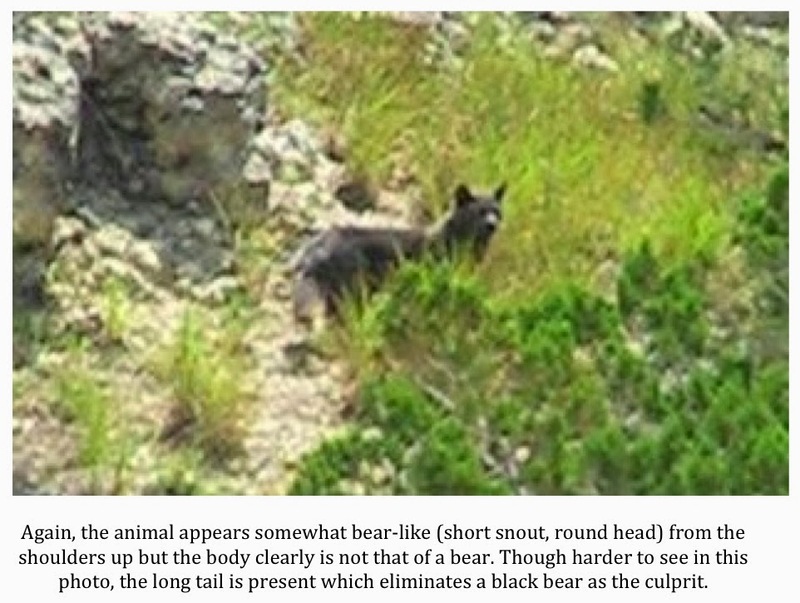 The head is very bobcat-like but the long tail eliminates the bob as a possibility. The cat seems very large but there is nothing in the picture of known size to provide scale. At first glance, it seems as if the cat would be as long as the rutted road is wide, however, it could be a trick of perspective as the road is at an angle to your camera. The coloring of the cat is very much like that of a common barn or house cat. The feet seem small for a truly big cat. It does seem very thick though. What complicates matters even more is that I get a different impression from each of the two photos. The picture where the cat is moving slowly gives me the impression of a big feral cat. The impression I get of the cat where it is jumping/running is quite different. In that photo it appears much more lean and less "fluffy" looking. The thing to do would be to get back to the site and photograph yourself or someone/ something else of a known size in that spot. Make sure the camera is in the same location. You could also measure the height of that small piece of brush the cat is walking by. If that is only a foot or so high then we know the cat is small. If it is 3 feet tall then we have something else all together. Please let me know if you decide to go back and take some photos for scale. The next set of photos also originates from South Texas. To me, they are more intriguing than the first set. 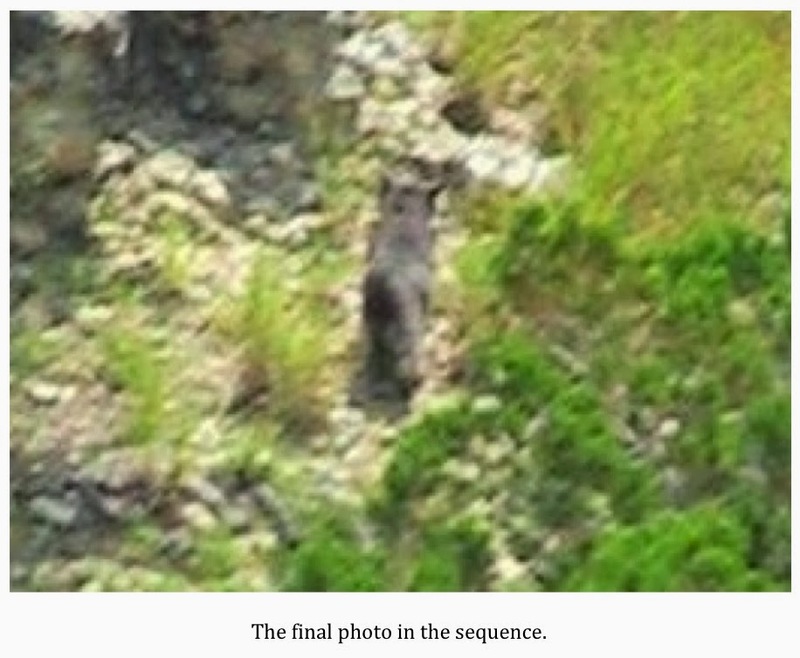 The series of shots clearly show a cat of some kind that is a very dark charcoal gray to black in color. According to the reader who sent the photos to me, the pictures were taken from a pretty good distance using a telephoto lens. 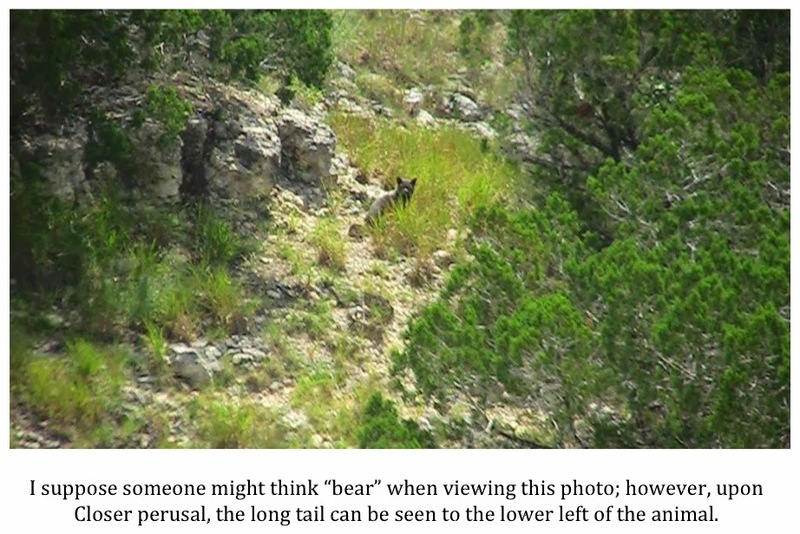 When the photos were shown to Texas Parks & Wildlife personnel, he was told he had pictures of either a bear or a coyote. There is one photo in the series where I can sort of see how someone might think “bear”… if I squint really hard. 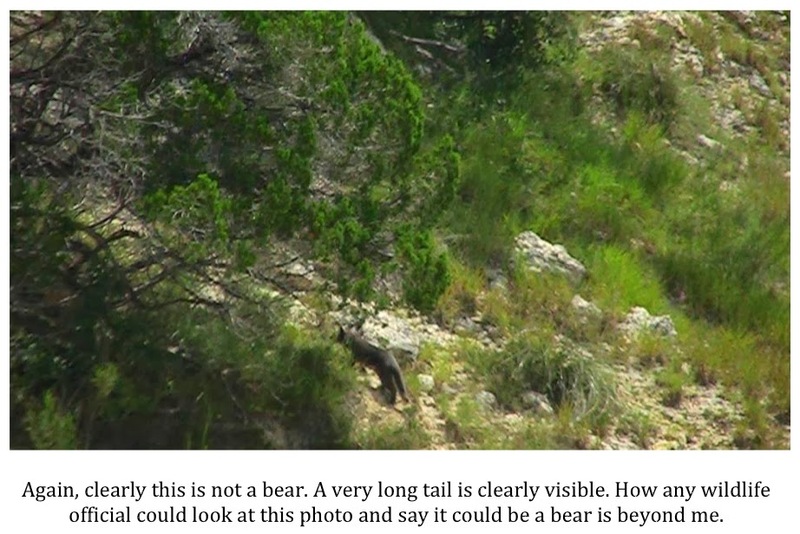 To say bear OR coyote is almost laughable to me as the two species do not resemble each other in the least. In my opinion, these are clearly pictures of a cat. That is really about all I can say. 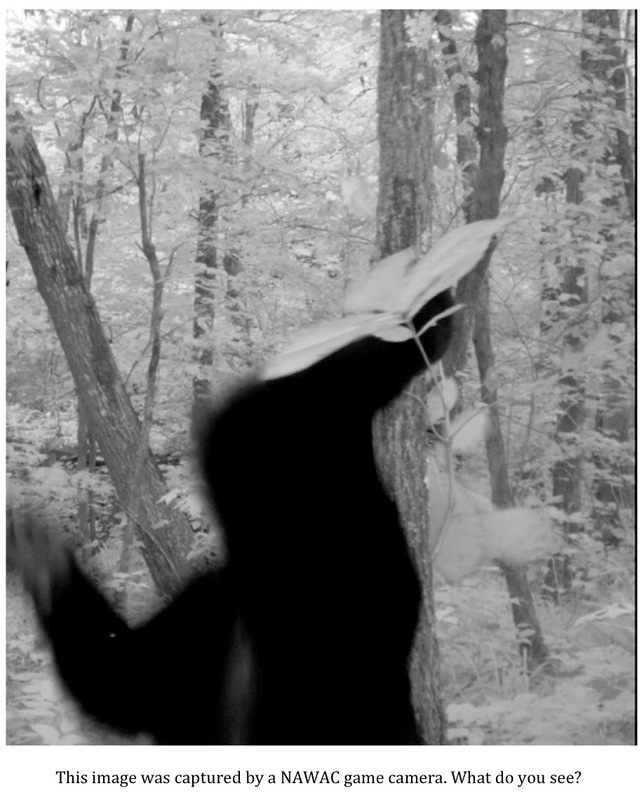 Are these photos proof of the existence of the ever-elusive “black panther?” Alas, no. 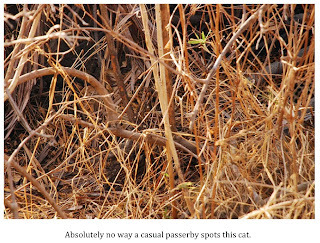 Even the reader who sent the photos knows this to be the case as he said, “those are the absolute best photos I've seen from anyone who sighted a black cat, and still they're not definitive!” His willingness to admit this makes me doubt very much that we are looking at some sort of hoax. The shots are very intriguing. The problem is there is nothing in them to indicate scale. 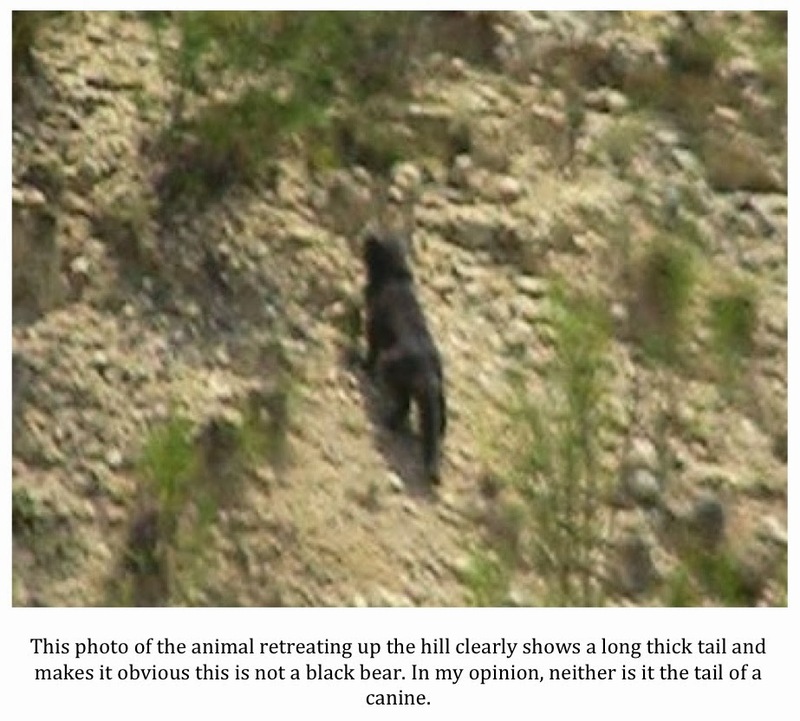 That being the case, it is hard to say how close the photographer was to the animal or how big it might have been. 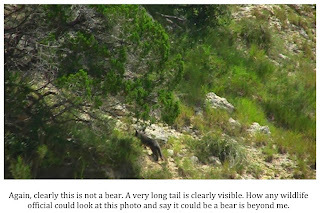 I can tell you it is NOT a coyote or a bear. It is a cat. Just don't know how large. *Please continue to forward me any reports and/or photographs of strange, odd or out of place animals. Feel free to make short comments to the post or, if you want to provide more detail or send a photo, use the Texascryptidhunter@yahoo.com email address.